Fujimi Garden Beach pools have been around longer than most of the prefectural summer pools (such as Kawagoe summer pools). They were refurbished and celebrated a “renewal open” 8 years ago. This year the pools are open from July 14th to September 2nd. The pools are generally open from 9 am to 5 pm, but on July 17th to 20th and from August 27th to 31st the pools will only be open half days. Cheaper than the prefectural pools, costing only 500 yen per adult and 300 yen for Junior High School Students and 100 yen for primary school aged children. Children under 6 years old are free in. 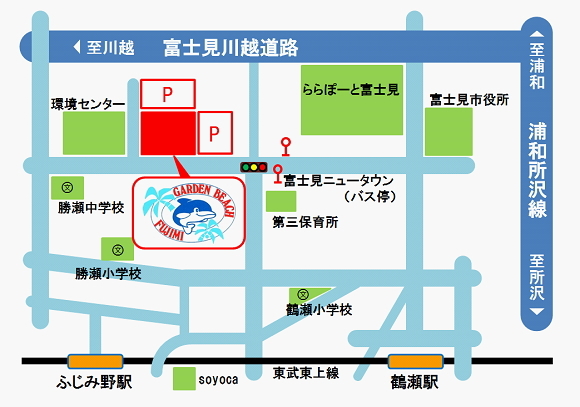 The pools are located close to Lalaport Fujimi. The pools are quite a distance from the nearest train station, but you can get a bus from Tsuruse station on the Tobu Tojo Line. The bus stop is on route 254 that runs alongside Lalaport. They have a limited number of car parking spaces. Parking costs 300 yen. For more pools and summer events in Saitama, please see the main event pages.